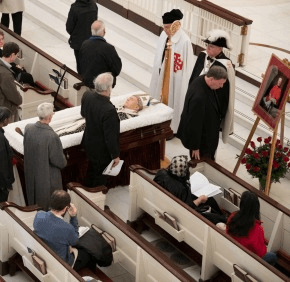 The body of Cardinal William H. Keeler, 14th archbishop of Baltimore, arrived at the Basilica of the National Shrine of the Assumption of the Blessed Virgin Mary in Baltimore a few minutes before 1 p.m. March 27, just as it became evident the drizzly chill of the morning would not characterize the rest of the day. Ten pallbearers carried the casket up the steps of the U.S.’s first cathedral, which Cardinal Keeler, who died March 23, had restored to the vision of its architect, Benjamin Henry Latrobe, also designer of the U.S. Capitol. “Come to me, all you who labor and are burdened, and I will give you rest. Take my yoke upon you and learn from me, for I am meek and humble of heart; and you will find rest for yourselves. For my yoke is easy, and my burden light” (Mt 11:28-30). Accompanied by Bishops Adam J. Parker and Mark E. Brennan, auxiliary bishops of Baltimore; Bishop Denis J. Madden, auxiliary bishop emeritus of Baltimore; and Father James Boric, rector of the basilica, Archbishop Lori blessed Cardinal Keeler’s body with holy water, and the casket was brought before the altar. The archbishop became emotional as he welcomed mourners, who filled the basilica. Baltimore Mayor Catherine E. Pugh was among those paying their respects. Cathy Farinelli and Mary Spaniol, parishioners of St. Jane Frances de Chantal in Pasadena, traveled from Riviera Beach to pay their respects. Farinelli recalled that her son, Justin, then 9, had met the cardinal in 1995, when St. John Paul II visited Baltimore. Her son also met the pope, and a photo taken of the future saint embracing her son and another girl, Melissa Brent, age 7 at the time, inspired the bronze statue in the Pope John Paul II Prayer Garden on the basilica property. Religious Sister of Mercy Frances Demarco lauded the cardinal’s ministry to the city and commitment to schools. “I know he did a lot for the poor, and he did a lot to promote justice among Catholics to assist the poor,” she said. She said that she had always been “really impressed” by the cardinal’s transparency, particularly when he released the names of 57 clergy, living and dead, who had been credibly accused of the sexual abuse of children. “I was upset when I heard he died, because he helped put the church in Maryland on the map,” Johnson said. The cardinal will lie in state at the basilica until 7 p.m. March 27, at which time a vespers service will include a chanting of the Office of the Dead. Members of the Knights of Columbus and the Equestrian Order of the Holy Sepulcher of Jerusalem will keep a vigil of prayer through the night. On March 28, Cardinal Keeler’s body will be at the Cathedral of Mary Our Queen in Homeland for public viewing from 9 a.m. to 1 p.m. A funeral Mass will be offered at the cathedral at 2 p.m.